You’ve designed a killer T-shirt collection … Now what? Little did anyone know back in 1913 when the United States Navy issued a thin cotton shirt that this would become a billion dollar industry. With so many styles and varieties offered by dozens and dozens of brands, tees are among the most popular apparel items purchased today. There are an estimated 1.4 billion cotton T-shirts are sold annually in the U.S., with a total of more than $18 billion in revenue. Sounds like your T-shirt business idea is a good one. And, making T-shirts is a fairly simple and largely automated process. Specially designed machines integrate cutting, assembling, and stitching for the most efficient operations. Screen printing is also popular, an innovation that has allowed the expansion of graphics on apparel. 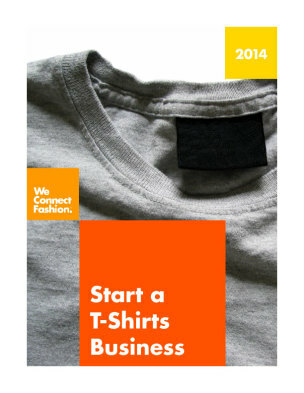 Start a T-shirt Business is a PDF guide written as a step-by-step roadmap to help you plan your business, promote your company, produce your product, and sell to buyers. Starting a t-shirts business is more than just putting logos on blanks. You’ll need to understand the operations of a dynamic fashion industry and how your new t-shirt line will expand and thrive in the future. Start a T-shirts Business keeps you current on rising commodity pricing, like cotton. With fluctuating prices, T-shirt brands are having a hard time pricing out their collections and these costs are taken out of the company’s gross margin, or, passed to the consumer. Start an T-shirt Business is built by industry experts who have been there, done that. This PDF publication is designed to help you plan your company, produce your product, promote your brand, and sell to buyers. This guide is downloadable immediately as a PDF document.